Award-winning writer Karen Coccioli has nurtured a love relationship with the written word since she was a young child when much to her mother’s chagrin she penned verse on the walls of her bedroom with crayons. Embracing education as a path to reach her dream as an adult, Karen pursued her doctorate in comparative literature from the University of Hong Kong. Karen made her literary debut with Echoes of the Heart (New York: Leisure Books). She won the National Poetry Award from New Millennium Writing in 2004, and her novella, The Yellow Braid (New York: White Ink Press) 2012 won Honorable Mention at the Hollywood Book Festival, 2012. Currently writing full time from her home in southern California, Karen's writing reflects her scholarly focus in feminist studies. Widowed and distanced from her only daughter, acclaimed poet, Caro Barrone is devastated by the death of her best friend. In search of emotional relief, she abandons her New York City apartment for the beaches of the Long Island Hamptons. There she meets beautiful thirteen-year old, Livia Valdez. All begins innocently, but their relationship takes a disquieting turn when Caro becomes obsessed with finding ideal love. 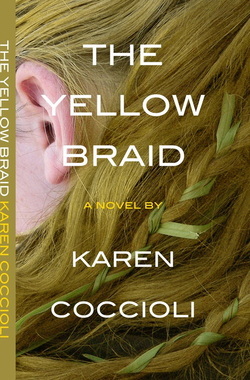 The Yellow Braid is a provocative look at a woman whose capacity for transgression is countered only by her capacity for transformation.